Swiss Exercise balls are one of today’s top fitness tools – and for good reason! 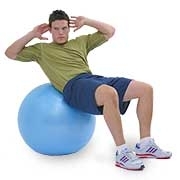 Swiss Exercise balls, can be incorporated into Pilates, Yoga and many other fitness routines as well as rehabilitation exercises. The Theragear Swiss Exercise Ball features extra thick walls, constructed to perform with exceptional durability for your workout. If the ball is punctured it will deflate safely and slowly. The Theraguard™ system is burst-proof up to 300 lbs. and has a 1500 lbs. Static Weight limit. It will not flatten out! All our Exercise balls are latex-free and come with a 1 year warranty on manufacturing defects. Burst Proof Strength: 300 lbs.